I was doing a bit of a mid-Summer-Spring clean the other weekend and got rid of a whole bunch of crap that had collected on my bookshelf. Bits and pieces from my dog that passed in May last year, motorcycle cleaning products, sunglasses that I cannot wear because I need prescription lenses. You know…the usual stuff that has no business being on the kitchen shelves, but collects there nevertheless. Then I got to the shelf where my completed sketchbooks live. It was messy and the books that I had shoved in unceremoniously over the past couple of years were balanced precariously and threatened to fall out. So I pulled them all out, sorted and re-stacked them, and as often happens, I could not resist having a flip through some of the older ones to see if I had made any improvement — because you know — procrastination. I told myself it was a mid-task reward. 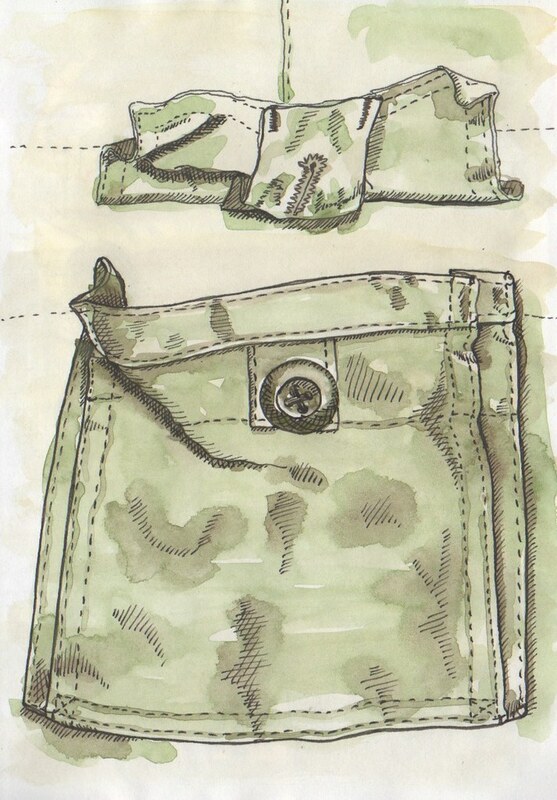 I found an old drawing of a cargo pant pocket from 2012 and it seemed to me, without looking any further afield, to be far more polished and advanced than some of the pieces I have been producing in the last six months or so. It surprised me and made me wonder why. What was the difference between the pocket drawing and one of this year’s drawings for example? This one below I did from a holiday photo, for example. 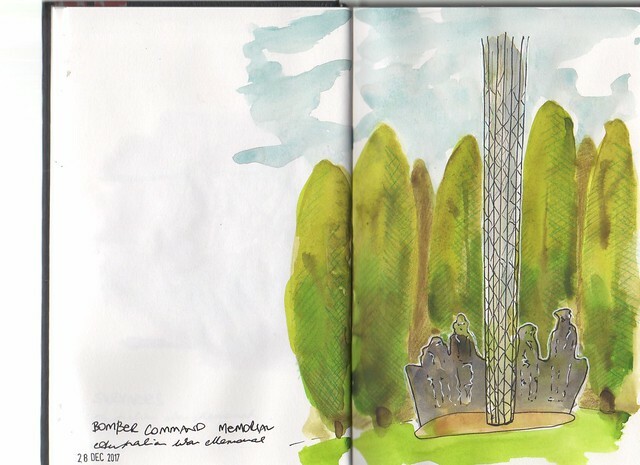 Or the Bomber Command memorial sketch which seems almost childlike in comparison. After some thought I came up with a few things that I think might be the case for me and my drawing. I did this one lunchtime from a holiday snap on my phone. It really just did not work at all. This was one of those sketches where I knew what I wanted to do in my head, but it did not translate to paper. When I was making those drawings back in 2012 I had more time on my hands. I was working full time but in a different set of life circumstances and I had larger blocks of time to give to drawing. My drawing was a haven into which I could escape, and I was hiding in my process. It was natural to spend a lot of time getting my sketches just right. Back when I drew the cargo pants pocket, I used to think I had to make sketchbooks full of pretty, polished pictures. 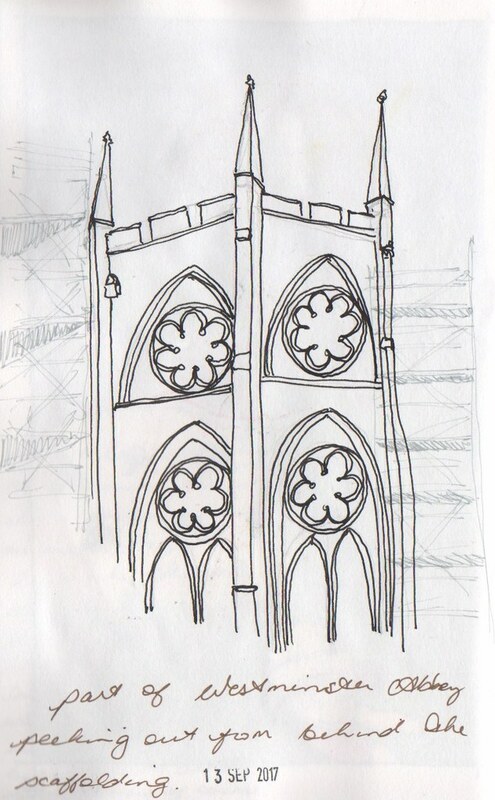 I wanted to be able to flip through a sketchbook and see pages and pages of stunning drawings. I didn’t want to waste my precious sketchbook pages with scribbles. I wanted my sketchbooks to look like those of artists that had been drawing for years and were naturally more polished, when I had only been painting with watercolour for a year or so. (here is an example of what I wanted my sketchbooks to look like) So I paid more attention and worked slowly and deliberately. I was intent on making “worthy” pieces. I didn’t succeed, but that’s what I thought a sketchbook should be, and so I tried to achieve that. There are a lot of factors that I can see that have an impact on my sketches in 2018, six years down the track. These days my life looks a lot different and I am exploring myself as a person as well as sketching techniques a lot more. I am trying to find my voice, so I try different things, different styles. I don’t care that my sketchbook doesn’t look like a published picture book, nor that it’s inconsistent. Now I have pages of paint swatches and colour mixes and scribbles from testing out pens. I am figuring out what I like to look at and what I like to do and how to pour my heart out onto the page. And that’s far from a neat thing to do. 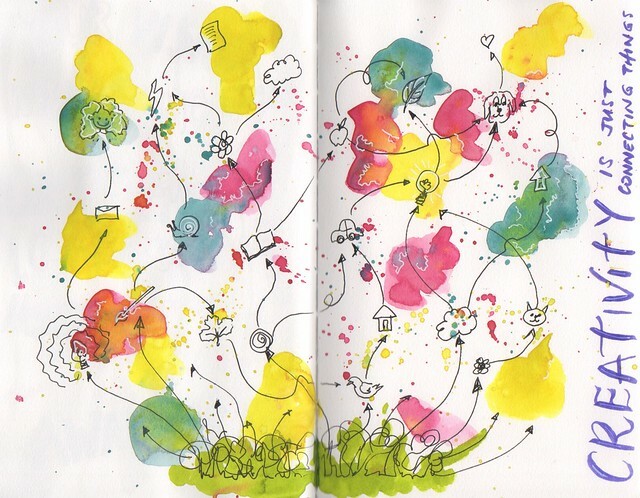 Life is messy, and so are my sketchbooks. There are several pages like this in each sketchbook where I am playing with paint to see what sort of results I can get. 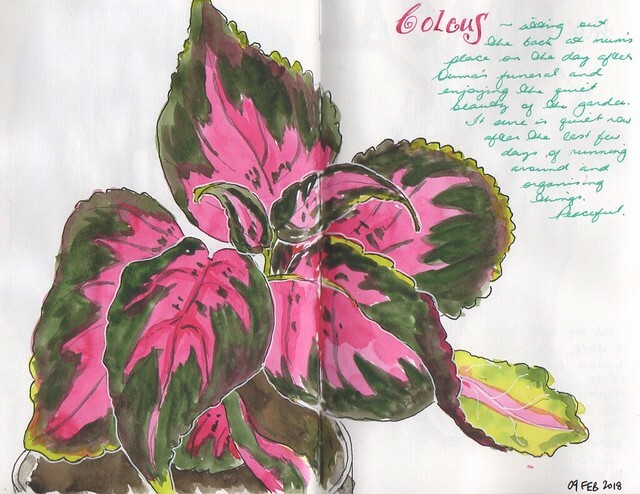 I use the time in my sketchbooks to practice — I am spending time perfecting little things — the shape of a leaf, or diving straight in with ink without a pencil under-drawing, or getting the watercolours to blend smoothly, or making sure I have sufficient contrast in my sketch, or learning how to sketch quickly on location. Sometimes I fail spectacularly. And that’s ok. Sketchbook pages are fair game. It helps too that I have found a good value for money option — it means that I am not so worried about “wasting” pages. I always have problems drawing plants and dealing with foreshortening in leaves. So this was not only therapy but practice as well. It seems often these days that the output in my sketchbooks is what I would call sub-standard because I don’t always have a lot of time to sit and draw. I have competing priorities that I juggle. I have other stuff that I need to get done, so I spend ten or fifteen minutes filling a page with something because I need to play with paint before I sit down to write or pay bills. It could also be that my standards for myself have shifted upwards over the years. I am striving to be better and more consistent. This literally took five minutes. It was a writing night but I wanted to at least splash a little paint around! Sometimes I am sketching as therapy. Like everyone on the planet, things happen in my life that I don’t like, don’t know how to classify, or don’t know how to deal with. 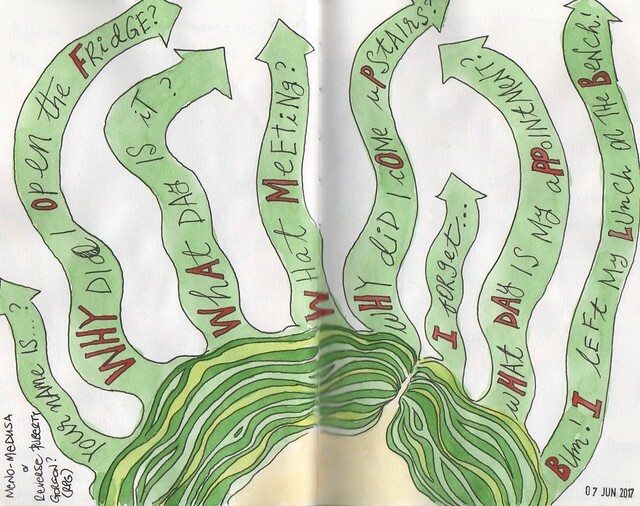 When this happens I use my sketchbook pages as a place to dump out the things that are whirling around in my head. It’s far cheaper than a therapist! Sometimes I can see the emotions in the paint strokes, sometimes it is the act of becoming absorbed in the drawing and painting rather than the product itself that is the therapy. My moods and feelings have a huge impact on what comes out on the paper. These pages are never going to look polished, because I’m not polished. Therapeutic … this one speaks for itself! An odd thing that I found affects the quality of my sketches was having to do a sketch every day when I take up a particular challenge, like the Drawing a Day challenge with my Sketchbook Skool klassmates. I wrote last year about the Every Day in May challenge being a great thing, and it was, but I am having a very different experience this year. Feeling like I must produce something every day is taking the fun out of it, and sometimes I am so worn out and depleted that I really do not have the energy to pick up a paintbrush. Life is just like that sometimes. It’s a bit of a two-edged sword, because being pushed to create something each day also pushes me to think creatively and to improve my sketching skills by virtue of the fact that I am forced to be prolific. This in turn has an effect on what my sketchbook pages look like. If I am not feeling the prompt for the day, the drawing will be flat and lifeless. However, if I stumble on an idea that tickles my fancy, then the drawing will be far more lively or poignant and most likely more polished. At the moment I aim to draw every day, but accept that sometimes life just doesn’t allow for it, and try not to get wound up about a non-existent deadline. This is an example of a “drawing a day” prompt quick sketch that worked well. I like the roughness of it, it adds to the feeling of being vulnerable. So all things considered…when I look back and compare pages from different eras, I need to remember that the pages are not necessarily better or worse…they are just different. They each have their own context, and I would rather have something on the page than nothing. Done is better than perfect, as the old truism says — with each stroke of the paintbrush or pen, I am either learning something, soothing something, or celebrating something. I should probably round this out by saying that I am not displeased with my current sketchbook contents. I am clearly making progress, and trust that I will continue to do so. I simply need to remember context when comparing sketches. Here endeth the existential crisis (for now anyway). Click HERE if you’d like to see a couple of flip throughs of recent sketchbooks to see the variety of pages and sketches. 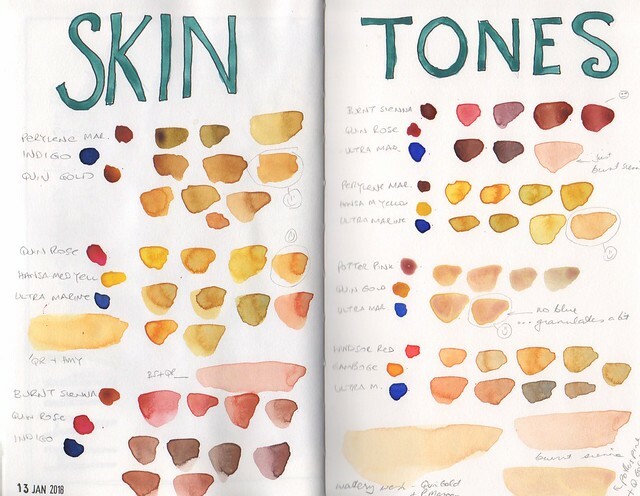 What sorts of things affect how your sketchbook pages look? Do you manage to be consistent in style and polish? Experimentation and play is exactly it 🙂 Thanks for reading Lori!